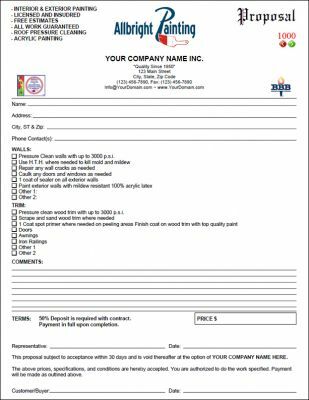 All purpose fillable forms for Painting Contractors for use with free Adobe Reader and Microsoft Word, templates, forms, interactive PDF forms. Fillable, painting contractor forms, Interior, exterior, residential, commercial, proposals, quotes, quotations, work orders, repairs, invoice, contract, change order, request for bid and more. General, All-Purpose, fillable, interior painting proposal used by professional painting companies and painting contractors. The form is for interior painting projects only, for residential proposals. Plenty of room to enter clients name, check boxes with predefined work lists for easy fill-in, scope of work with check boxes to list home areas to quote, bedrooms, bathrooms and guarantee that you offer. 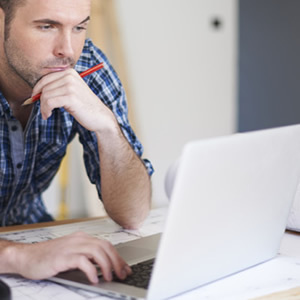 A section for any amendments and exclusions keeps proposal open and keeps you protected. There is also an area for customer to choose a paint "finish" and a particular paint brand, or "other". 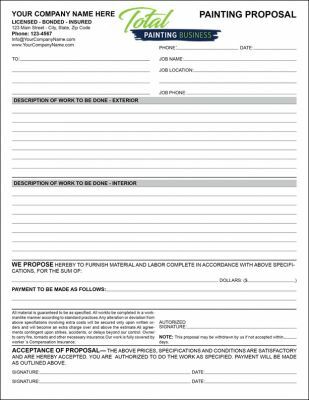 Proposal and acceptance of proposal with date and signature lines, at bottom of form. A fillable, painting contract and can also be used as a wallpaper covering or even for other professional trades, just add your logo and start using the form. 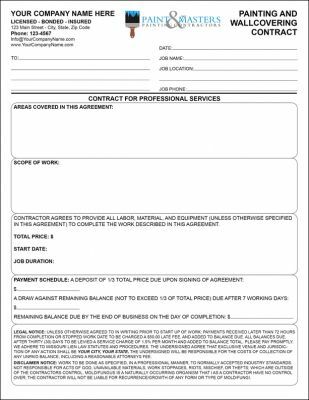 Includes space job details, scope of work, total price, starting and job completion time, payment schedule and terms of contract in back side. Helps avoid customer misunderstanding or disputes along the way ensuring you a smooth painting job transaction from start to finish. 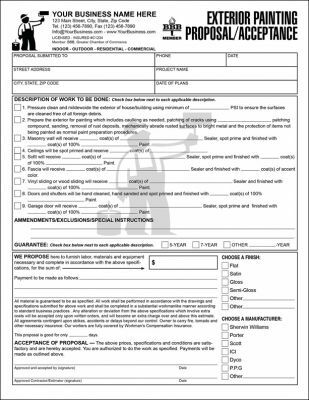 This fillable, painting proposal is designed to keep a full record of the details discussed between the contractor and the client. Easy to record the potential customer's information at the top of the form as well as job or project information. The form's description of work to be done has been split into two sections, one for exterior and the other for interior, this helps avoid confusions as each section has been separated. It includes the proposal and payment payment terms and schedule. Followed by painting industry accepted terms and conditions and acceptance signature lines at bottom of form. General, All-Purpose, fillable painting proposal used by professional painting companies and painting contractors. The form can be used for interior, exterior, residential and commercial proposals. 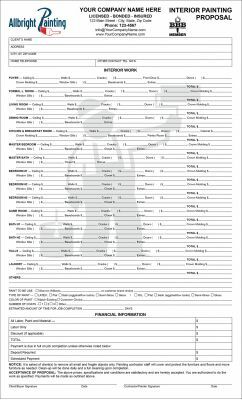 The form contains room for customer information and itemized job/work list with check boxes which allow the customer to see exactly what the contractor is promising to do, space to record comments and payment details with industry standard terms and conditions and signature lines for representative and customer. General, All-Purpose, fillable, Exterior painting proposal used by professional painting companies and painting contractors. The form is for Exterior, residential or commercial painting jobs and projects only. 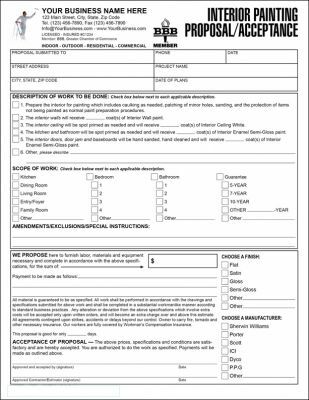 Plenty of room to enter clients name, check boxes with predefined work lists for ease filling-in the form. A section for any amendments and exclusions keeps proposal open to any additions and keeps you protected with exclusions added to the proposal, be sure job runs smooth from start to finish. There is also an area for customer to choose a paint "finish" and a particular paint brand, or "other". Proposal and acceptance with date and signature lines, at bottom of form. Colors: Available in black only, plus includes 20 colored backgrounds to give your form impressive color effects.